Full Time Professional Buyer’s Agent for the discerning buyer. I’ve compiled a list below of skills a good real estate agent would have on the left side and compared that to many of the real estate agents that I have known and heard about around the country in 37 years in the business. Which Realtor would you choose? 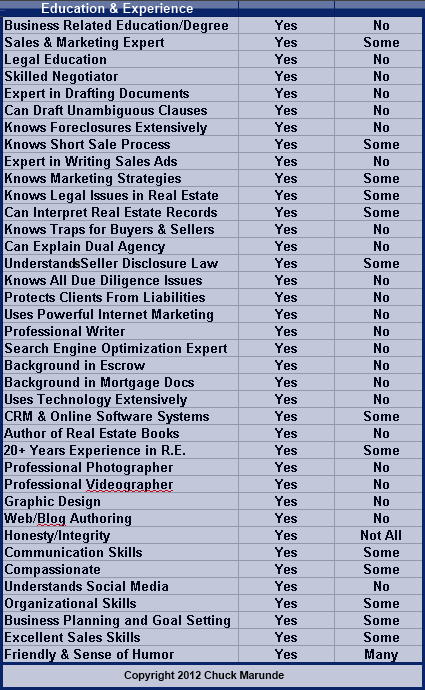 Would you choose the agent with all of these marked “yes” or the agent with only some of these qualifications? Of course, a good real estate agent doesn’t necessarily have to have all of these qualifications, but the more the better. As you might guess, this chart is a list of my qualifications. I hope you’ll hire me as your Buyer’s Agent. We are ex-Washington residents who currently live in Arizona. We had been searching the Puget Sound area four years for a waterfront property to build a retirement home when we first contacted Chuck Marunde through his website. We had made multiple trips to various areas but most of the Realtors we contacted simply sent us an email, provided no follow up and did next to nothing to help us locate a property. On our first trip to Port Angeles, after connecting with Chuck, we purchased our dream property. We now own a high bank waterfront lot overlooking the Straight of Jaun de Fuca, and are excited to become part of the Peninsula community. Paul & Linda M.
Private law practice in Washington since 1986 with a four year stint as a JAG in the USAF. My private practice focused on real estate (with some time in estate planning, probate, litigation, and business development). I have advised thousands of real estate and business owners, investors, developers, builders, and Brokers. I’ve also been intimately involved with an international technology company. I have created many businesses, their structures and long-term strategic development. I have litigated issues around the state, drafted numerous contracts, and resolved hundreds of disputes amicably and through arbitration. Credentials have also included Certified Estate Planner, Registered Investment Advisor (Series 7 and Series 66) and licensed in insurance and certified in long-term care. May 1, 1991 to January 1993 – Area Defense Counsel, Nellis Air Force Base, USAF, Feb. 1989 to May 1, 1991 – Assistant Staff Judge Advocate, Nellis AFB, USAF. Positions included: Government Prosecutor, Chief of Claims, Chief of Legal Assistance, Chief of Preventive Law. Chuck is on all social media, and you can Friend him on Facebook as well.